It's chilly outside this morning but warm in the FFA Greenhouses today. 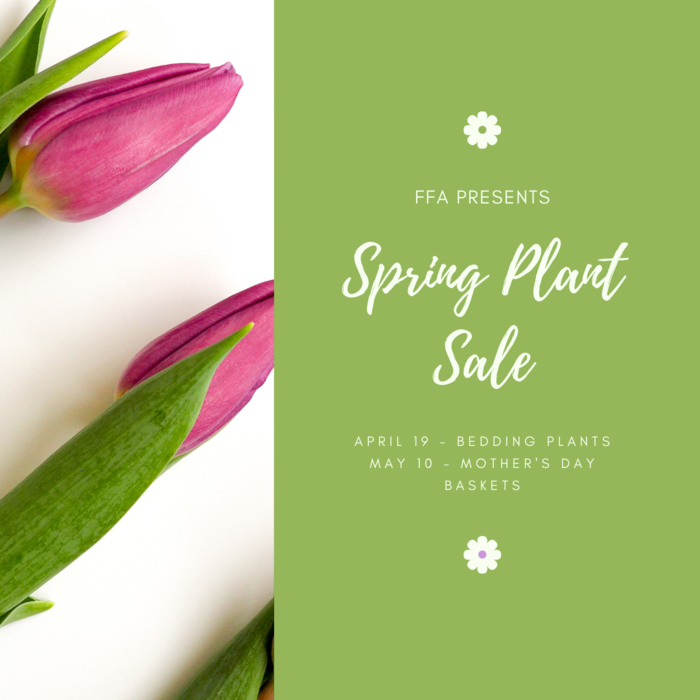 Come see the beautiful flowering plants we have for sale. Prices are great! 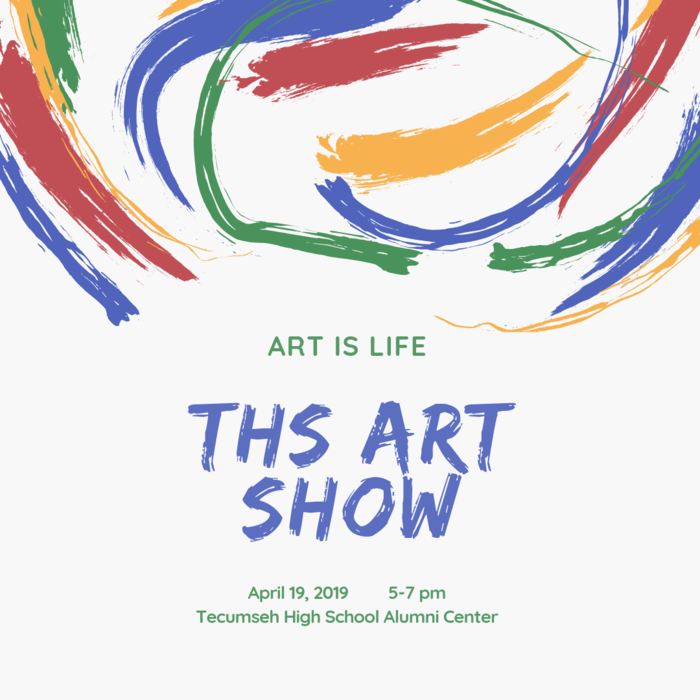 Just a reminder -- There will be some beautiful student art work to view at the annual THS Art Show this afternoon. Come join us in the alumni building from 5 - 7 pm. Admission is free. It's Easter Egg Hunt Day at TECC! Kindergarten will be at Slick Humphrey Park in two sessions @ noon and 12:45 pm and Pre K is hunting at the THS Football Field @ 1:30 and 2 pm. It's McTeacher Night at Tecumseh McDonalds tonight from 5-7 pm. Have dinner at Mickey D's and help our schools at the same time! Thanks for your support. Don't forget we will be enrolling for Pre-Kindergarten all day on April 25 at Tecumseh Early Childhood Center. We look forward to meeting your children on that day. Welcome grandparents to Tecumseh Early Childhood Center! We hope you enjoy our special activities we have planned for you today. If you have any questions or need assistance while you are on our campus today please see the smiling faces in the TECC main office. Congratulations THS Band. . Two excellent ratings at state solo/ensemble competitions today! Tuesday, April 16 is progress report day for Cross Timbers, Barnard and TECC. Be looking for those grade updates in your little ones' book bag on Tuesday evening. We are sooo excited for Grandparents Day on April 17 at TECC and looking forward to meeting everyone. Welcome to our beautiful new school building! 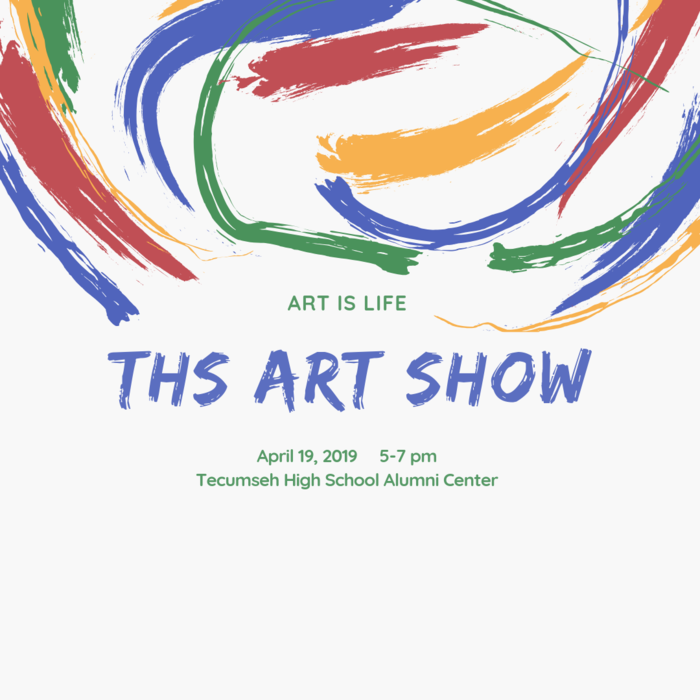 There will be some beautiful student art work to view at the annual THS Art Show on Friday April 19. Come join us in the alumni building from 5 - 7 pm. Parents -- April is state testing month for TPS. It's important to have children in school every day for testing and test prep activities. Thank you for your cooperation and assistance in making sure our students perform at their very best. It's book fair time. Students will be shopping on April 4 and 5. For questions regarding the sale you can call the main office. 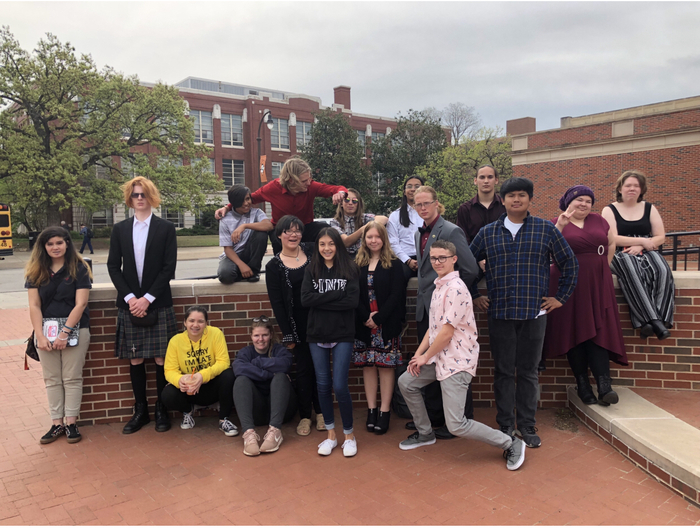 High school performing arts students are excited for state competitions. Band will compete March 28 and choir will present materials on March 29. Good luck everyone. Seniors 2019 -- Tecumseh Alumni Scholarship applications are available for pickup now! Deadline is April 26. There will be 18 $1000 scholarships up for grabs. Apply today. ACT is coming up for all juniors at THS. Please check the news section of the high school page to download helpful test prep tools for your student. Welcome back students and staff. We only have 41 days of school left in this school year. Make it the best days of your life so far! Try hard and do your greatest work. Have a safe and happy week. We've got beautiful artwork on display and for sale during parent-teacher conference nights in the middle school AP room. Come see what our middle school art students have been doing this year. Many items are for sale. Show is 4:30 - 8:30 pm March 12 and 14. The state powerlifting meet is this Saturday, March 15 in El Reno. Tecumseh will have four entries: Brody Peters, Jacob Smith, Navy Risinger and Micah Boyce. Good luck guys! This is a good time to buy a yearbook. Inquire at the main office of your child's school site on Parent - Teacher conference night for purchase details. Reminder -- Parent-Teacher conferences are this week. March 12 and 14 from 4:30 pm - 8:30 pm. To avoid a long wait, you need an appointment. Please call the main office at the school site your child attends to set up a time. Parents -- March 12 and 14 are Parent-Teacher Conference nights from 4:30-8:30 pm for grades Pre K- 8th grade. If you would like to speak one on one with your child's teacher, please call the appropriate school site office to set up an appointment. March 12 and 14 from 4:30 - 8:30 pm high school students will complete their spring enrollment. If your child will be in grades 9 -12, please call the high school office at (405) 598-2113 to confirm or schedule an appointment. This is AWESOME! THS Band is headed to STATE with it’s superior rating earned at district competition today. We are very proud of our student musicians and our directors. Way to go Savage Pride. See you in the big contest March 28. Our high school robotics team will have its first regional competition this Saturday at the Cox Convention Center. Come out and see some great engineering minds at work! Admission is free. Qualifying matches are Friday, March 8 from 9am-6pm. Finals are Saturday all day. School closing update — Tecumseh Public Schools will be closed Thursday, February 28 due to icy road conditions. Attention alumni family and friends. We are changing the Turkey Noodle Scholarship Fundraising Dinner to March 10. Same great food and same worthy cause. Just moving it back a week to March 10 from 11am-2pm. Hope to see you then. He’s less than two hours away from wrestling for gold status. Come see senior Tyler Bingham as he competes at 170lbs for the class 4A state championship. Doors open at 4:30 with opening ceremonies beginning at 5:15 pm at the OKC Fairgrounds Arena. Come on everybody!!! Good luck to Savage wrestler Tyler Bingham who will wrestle for a state championship this weekend at the OKC Fairgrounds. Way to go varsity girls basketball team! You are still alive in regional playoffs. Next game is today at 1:30 pm in Anadarko. The Lady Savages will face Pauls Valley. Congratulations Tyler Bingham regional runner up wrestler. Good luck as you wrestle for state gold this weekend! We are still alive in post season basketball play as the varsity boys and girls will play at least one more game in the regional tournament on Thursday at Anadarko High School. Game times TBA. Thank you to our support staff for preparing sidewalks and parking lots yesterday so that we could have a safe arrival to school this morning. We are back in business today. Welcome back after an extended Presidents' Day weekend. Watch out for slick spots on your way to school this morning. TPS will be closed on Monday, February 18 for Presidents' Day. Enjoy your break. Reminder - Tecumseh Public Schools will be closed on Monday, February 18 for Presidents' Day. Classes will resume on Tuesday morning. Today is Ice Cream Sundae Party day! It's going to be a yummy event from 2:30-3 pm. We have an athletic schedule change to make--Wrestling Senior Night originally scheduled for January 31 has been moved to Thursday, February 7. Please make a note: Basketball homecoming ceremonies will be moving to Friday, February 8. However, the game with Prague originally scheduled for February 1 will go on as scheduled. You are invited to a candlelight vigil honoring Logan Deardorff and Shelby Johnson at 6 pm this evening in the Alumni Center. Deepest sympathies and condolences to the families of Logan Deardorff Class of 2019 and Shelby Johnson Class of 2020. Bethel will visit Tecumseh tonight for varsity basketball. JV girls game will open at 4 pm. Students and families we want to remind you that classes will be dismissed Monday, January 21 in observance of Martin Luther King, Jr. Day. 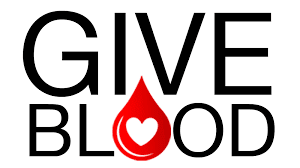 The first blood drive for 2019 at TPS is January 29 from 9 am - 2 pm in the high school alumni building. Appointments will be taken by contacting Debbie Humphrey at (405) 598-2113. Walk-ins will be welcome as well. 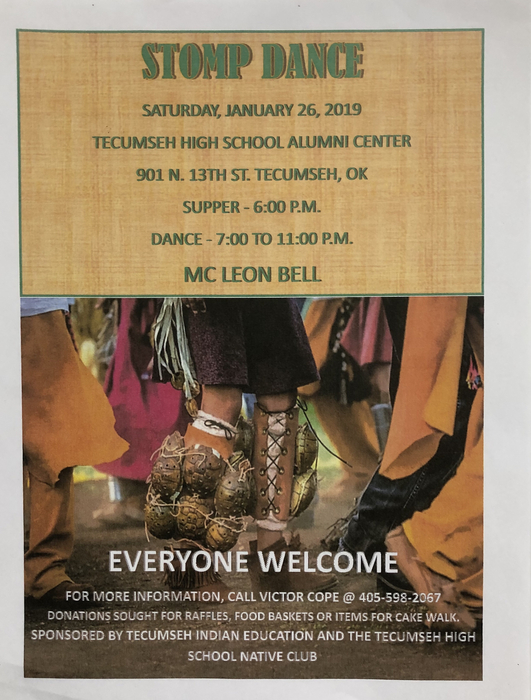 Come on out on January 26. Welcome back students and staff to the second semester of the 2018-2019 school year. Make it your best start ever! The varsity basketball game at Little Axe will go on as planned tonight. JV boys will begin at 5 pm with varsity girls and boys to follow. The Board of Education office will be temporarily closed in the morning hours January 4 due to inclement weather. Please call ahead (405) 598-3739 before visiting the office. Inclement weather update— Due to the heavy snowfall and icy conditions that have moved into the area, Tecumseh Public Schools will not have professional development meetings tomorrow. Normal classes for all grades will resume on Monday January 7. Operating hours for the Board of Education office will return to normal which is 8 am - 4 pm beginning Friday, January 4. Due to inclement weather and hazardous road conditions there will be a change in Friday’s work schedule. Certified personnel should report to buildings at 10 am. Consult your work email or site specific text chains for updated information on adjusted meeting times. Proceed to work with caution tomorrow and be aware of icy sidewalks and parking lots upon your arrival. TPS Board of Education will have altered business hours during the holidays. Offices will be closed December 24-26 and December 31-January 1. Offices at the individual school sites will be closed the entire holiday break. Classes will be dismissed for students for Christmas break from December 21 - January 6. First day back to work for teachers is January 4 and the first day back for students is January 7. Have a safe and happy holiday! The first show of the Christmas music program will begin at 6: 15 pm and will be in the TECC gymnasium. Doors open at 5:45 pm. TECC invites families and friends to join us for the Kindergarten Christmas music program on Thursday, December 13. The Savage Pride Band invites you to join them for their Christmas music concert tonight at 7 pm in the Alumni Center. Don't forget that the Christmas lunch for Kindergarten students and their families is tomorrow. We look forward to seeing you there. It's class picture day. Bring your sweet smiles to school today! The hands on S.T.E.A.M. learning center is just a few days away from being ready to receive students. The southeast part of the Krouch center will have classrooms open to serve students in all grades who need to work on S.T.E.A.M. learning activities. Details coming soon. Thursday, December 6 is the Kindergarten Christmas lunch. We are so excited for our students to enjoy lunch with their families. Welcome back to TECC! Tomorrow we will be doing class pictures. So come to school with your smile one! Parents and family members--There is NO emergency at Tecumseh Early Childhood Center. Fire crews were called to the scene for a maintenance only procedure. Absolutely no one is in danger. Thank you for your understanding. 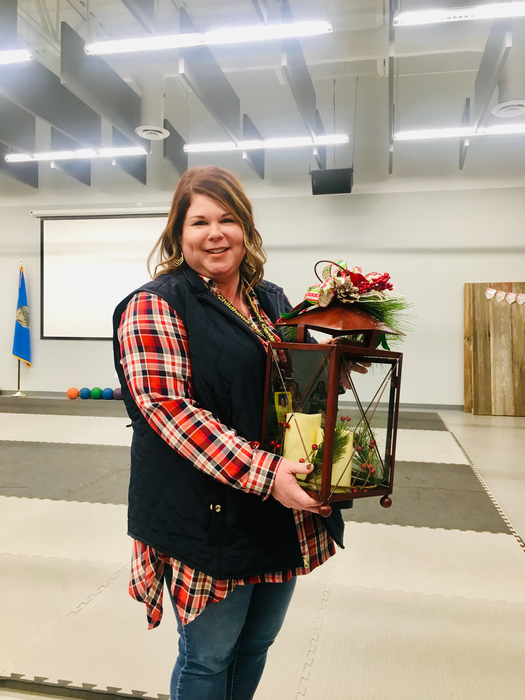 We are very pleased to announce our site teacher of the year is Mrs. Amanda Raper. Congratulations! Savage wrestlers will travel to Newcastle for a weekend tourney Nov. 30 - Dec. 1. Go Savages! Friday night is the home opener for Tecumseh High School basketball. JV games will begin at 4 pm. Come support the Savages. A Meet the Savages wrestling debut is tonight in the high school Alumni Center at 6 pm. Come see who will represent our school on the mats this year. It's time for some varsity basketball! Let's go Savages, beat the Noble Bears. Games will be played at Noble and begin at 4 pm. There is a blood drive today in the high school alumni center. If you can give, it will be much appreciated! Welcome back to school. We hope you had a restful Thanksgiving break. Let's make these last few weeks the best yet to guarantee a strong finish for the first semester. 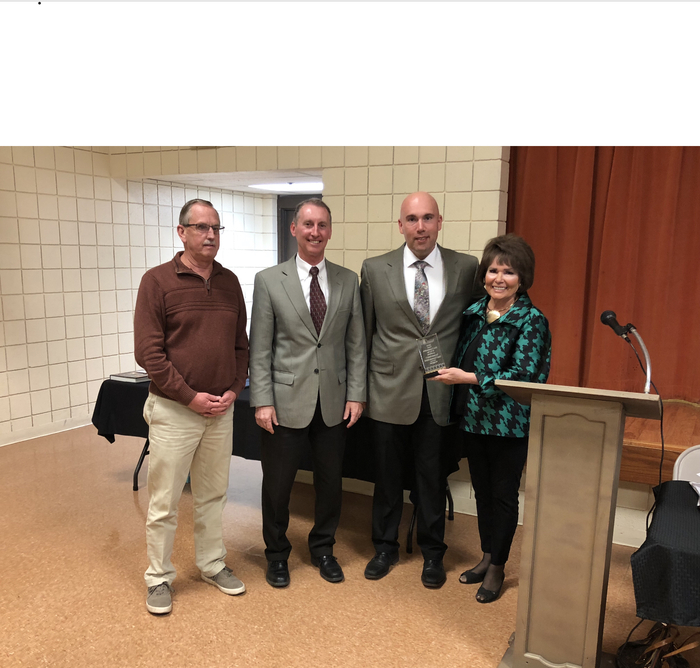 Tecumseh Public Schools is pleased to accept the award for New Construction Project of the Year from the Tecumseh Chamber of Commerce. We thank the tax paying citizens in the Tecumseh school district who helped make the new early childhood center a reality. Good luck to our performing arts department on opening night of The Sound of Music. Performance is at 7 pm tonight and Friday night as well. November is Native American Heritage Week. Tecumseh Public Schools is extremely proud of our rich Native American history. We are very thankful for the impact and influence our Native American communities have had on educating the children of TPS. The Sound of Music presented by the vocal music department will open on Thursday night at 7 pm. Tickets are $5 for students and $7 for adults. Military and over 65 are $5. Play runs through Friday. He will be here in just a little while...Santa Claus is coming to TECC for pictures today. We are so ready for him to visit us. The FFA Pig Roast and Labor Auction will be Friday evening at 6 pm in the alumni building. Come hungry and ready to shop for beautiful metal fabricated items handcrafted by power tech students. It's Election Day in Oklahoma. Exercise your right to vote by 7 pm tonight. Tecumseh's FFA chapter invites everyone to the annual Pig Roast and Labor Auction Friday, November 9 in the alumni building. Serving line opens at 6 and yes, we will have to-go plate options. Tomorrow is election day for Oklahoma residents. We are reminding all registered voters that every vote counts. It's a long way to 1,000,000. Let's count the steps we are taking and reach our Million Mile Challenge earlier than May 21. Remember the Million Mile Challenge? 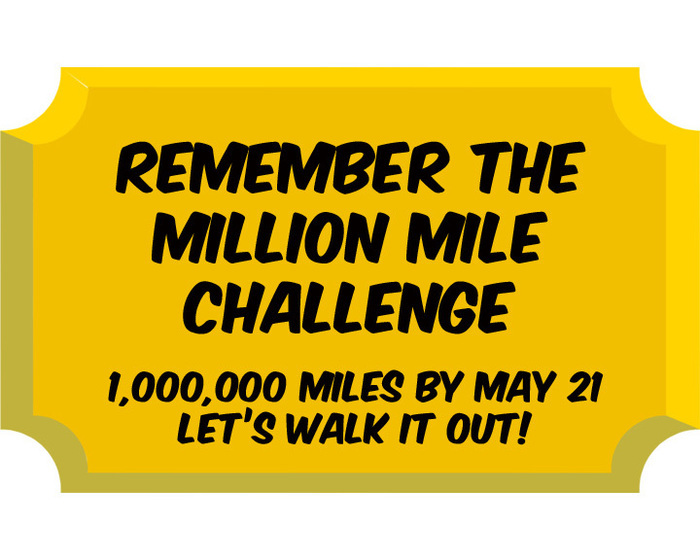 Our students staff and families have been challenged to walk a combined total of one million miles by the last day of school. THS has recorded 105,075 miles so far! Are you kidding? The challenge is on to the other sites. What do you have so far? A substitute teacher workshop is planned for November 7 at 9 am. Please call the BOE office at (405)598-3739 to register. You must complete this workshop to work for Tecumseh Schools. The workshop is free. Good morning Pre K and Kindergarten students. We are so excited for you to get it here because it is Rise and Shine Friday!!! Good Luck to senior Kayla McGruder who will run in the Class 5A Cross Country State Meet on Saturday, October 27. You can do this girl. We are cheering for you!!! The field trip to Sunshine Shelly's Pumpkin Patch is back on for October 29. Hip, hip hooray! What a week we have coming up. We will close this week with a terrific Rise and Shine program. It's a can't miss kind of week at TECC! Thursday all Pre K and Kindergarten students will be receiving free dental screenings from Ocean Dental. Thank you for supporting our children! Don't forget that Wednesday, October 24 is Wear Orange Day. The Caring Van will be here today for free flu shots. It's not too late to sign up. Call the main office for details. Tonight is Senior Night. We will honor senior football players and managers as well as cross country runners, cheerleaders and band members. Ceremonies begin at 6:55 pm. Go Savages beat the Bethany Broncos. Game is at 7:30 pm. The Savage Pride Marching Band will present its annual light show during halftime of tonight’s football game. It’s a can’t miss event. Hope to see you there. The Savage Pride Marching Band invites everyone to see its annual light show this Thursday, October 18 during halftime of the Tecumseh vs. Bethany football game. Savage Color Run participants, due to the rainy weather today and the forecast for tomorrow we have made the executive decision to postpone our event. We do not want to take any chances of anyone getting hurt on a muddy trail or any kids getting sick. We will let you know as soon as possible of our new event date. Thank you for understanding. What a great day for a Kindergarten field trip to Cornerstone Ranch. We are going to have so much fun. Attention parents who have children that ride bus #7 —We are running about 35-40 minutes late on getting your children home. Thank you for your patience! Good luck Savage Pride Marching Band as you compete in the regional contest today. Bring home the win. You got this! Thank you to everyone who came out to see our new early childhood education facility. It was a pleasure to show off this beautiful building. With the deepest of gratitude we thank the citizens of the Tecumseh school district for making this dream for our students come true! We will be doing free hearing evaluations on Tuesday, October 9 for all Pre K and Kindergarten students. For questions regarding these free screenings please call the main office at 598-2967. Everyone is invited to an Open House at Tecumseh Early Childhood Center Thursday, October 4 from 5 - 7 pm. 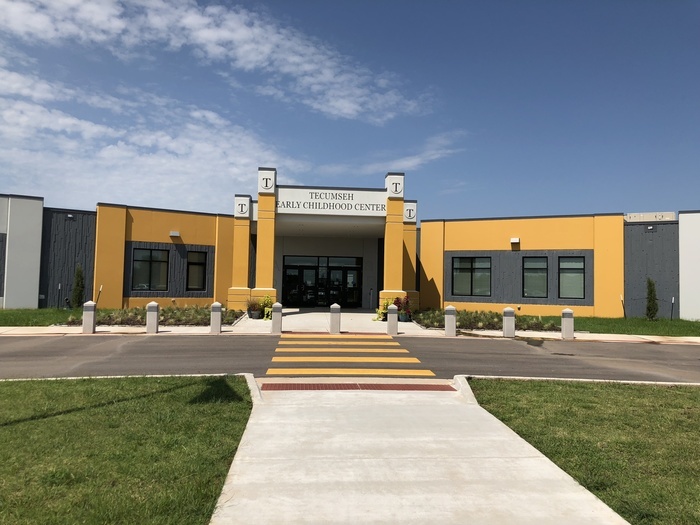 Come see this beautiful building at 1406 N. 6th Street which was made possible by the generous property owners in the Tecumseh Public School District. Time is running out to register for Cross Timbers Savage Color Fun (d) Run on October 14. The September 30 date guarantees a free runners gift pack, so hurry and register online via the story under the news section. Don't forget that tomorrow is wear BROWN day. It's almost time for Rise and Shine which is Friday, September 28. We have a terrific program planned for our TECC Lil' Savages because you are awesome kids! Due to the weather forecast homecoming ceremonies have been moved to the Alumni Center and set for 5:45 pm. Admission is free but you will be able to buy game tickets at the door to provide for quick entry to the stadium following the ceremony. Homecoming coronation ceremonies will be moved to the Alumni Center and will begin at 5:45 pm. Seating is limited. Game admission will be charged and you can pay at the door and then move immediately to the stadium for the game following the coronation. Friday’s pregame Jr. Class BBQ dinner will go on as planned in the Alumni Center 5-7 pm. Tickets for the meal are $5 each. Lots of updates regarding football homecoming activities. Game time has been moved forward to 6:30 pm. Weather for homecoming tomorrow night might be a BIG problem. Check the live feed regularly for updates. Thursday night is McTeacher Night at McDonald's of Tecumseh. Support your Tecumseh Early Childhood Center by purchasing food at your local chain location. Coronation for THS homecoming will begin at 6:55 pm on Friday, September 21. Don't forget that Wednesday is wear purple day. Hey football fans don’t forget that tonight’s game with Bridge Creek will be played at Newcastle High School’s facility. Game time is 7:30 pm. Don't forget -- There is no school tomorrow (September 14) at any of our sites. Gordon Cooper students WILL have class tomorrow. Parents -- This is the last night for first term parent teacher conferences. Please call the main office at your child's school site to schedule an appointment. 4:30-8:30 pm. Appointments are STRONGLY SUGGESTED. It's parent teacher conference week. If you wish to speak to teachers about the progress of your children, call the main office at the site your child attends to schedule a time. Appointments are STRONGLY SUGGESTED at all sites to insure the teacher has time to visit with you. Shout out to Tecumseh Varsity Cheer and Savage Pride Marching Band. We appreciate the work you do to build school spirit. You are a part of something great at THS! Can't be at the game tonight? Keep checking the live feed for score updates. We can keep you posted. Don't let the rain keep you away from Savage Field tonight. The excitement is building. We are ready to roll -- 7:30 pm kickoff. Please make a note--The Junior Class Barbecue Dinner previously scheduled for September 7 has been changed to September 21 from 5:30-8 pm. Shout out to the Savage Pride Marching Band for your hallway marches through all the school sites today. Way to work that school spirit. Football kickoff pep rally this afternoon at 5:30 pm in front of the Central Oklahoma Chiropractic Clinic. The blood drive is today!! We will be in the Alumni Center. Fill out permission forms in the main office. Save a life--DONATE BLOOD. THS BETA will sponsor a blood drive on August 28 in the Alumni Center. Permission forms can be picked up in the main office. How exciting--The 2019 Lil Savage yearbook will be published in full color this year for the very first time. The order store will open on September 3. Books are $28. There will be a Free Eyeglass Event on Saturday, August 18. Check the district's main page for details. Parents we would like to remind you that Krouch Early Childhood Center has a new name and a new location. We are now known as Tecumseh Early Childhood Center and we are located at 1406 N. 6th Street. School begins on Thursday, August 9. Open House is August 7 from 5:30-7:30pm. Come and meet your teachers and see our beautiful new building. We can't wait to show you and your parents around the new place! Parents if you were not able to make it to district wide enrollment on July 26 you will need to visit the main office to complete the procedure during regular school hours in the coming days. School starts August 9.